What is Fuse Workforce Payroll? Fuse Workforce Payroll is a platform that unifies major elements found in time and attendance management, human resources management, and payroll into a compact, comprehensive package. With all goodies in one bag, users no longer have to switch from one software to another to get their job done. 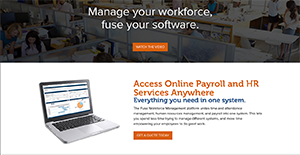 With the Fuse Workforce Management Payroll module, you are in total control of each and every payroll process. The module lets you access payroll data anytime you need it. You can also perform real-time calculations to get a view of what people are doing and how much their performance is costing you. Processing is easy and if you need to get their final pay statements, everything is just a mouse click away. The Fuse Workforce Management Platform allows users to channel their attention and energy on other pressing matters without worrying on stuff like payroll and HR processes. By integrating all of your important Human Resources and Payroll functions into one system, you are basically free to do anything else. With Fuse Workforce Management Payroll, users have the pilot seat and are in full control of all their payroll processes. The system’s continuous processing enables users to access and generate payroll information whenever they need it. Everything is calculated in real time. This ensures that you are aware of all the processes, your workers’ progress, and how much you are paying them to do their roles. With the flexible pay rules engine, Fuse Workforce Management Payroll makes determining pay for regular or overtime hours simple, fast, and accurate. Information-rich dashboards, reports, and decision support features offer visibility and insights across the organization. Find crucial information with speed and ease, thanks to the system’s intuitive navigation tools like application tabs, quick links, drill-down, and more. Users also get immediate access to time sheets, schedules, payroll, employee records, and other data, ensuring that you are well informed to make smart business decisions and achieve desired results. No need to manage multiple programs as all payroll processes, time and attendance, applicant management, and more can be handled in a unified system. Fuse Workforce Management Platform is hosted in the cloud, which means you are always running the latest software and there is no need to download software or purchase external drives and additional hardware. Companies have diverse needs and requirements and no software platform can be perfect in such a situation. It is pointless to try to find an ideal off-the-shelf software system that meets all your business needs. The wise thing to do would be to adapt the system for your special needs, employee skill levels, finances, and other factors. For these reasons, do not rush and invest in well-publicized trendy systems. Though these may be widely used, they may not be the perfect fit for your specific wants. Do your homework, investigate each short-listed system in detail, read a few Fuse Workforce Payroll reviews, speak to the seller for clarifications, and finally choose the product that presents what you need. How Much Does Fuse Workforce Payroll Cost? Fuse Workforce Payroll pricing is available on a by quote basis only. Contact Fuse Workforce Payroll directly for more detailed pricing information. We realize that when you make a decision to buy Accounting Software it’s important not only to see how experts evaluate it in their reviews, but also to find out if the real people and companies that buy it are actually satisfied with the product. That’s why we’ve created our behavior-based Customer Satisfaction Algorithm™ that gathers customer reviews, comments and Fuse Workforce Payroll reviews across a wide range of social media sites. The data is then presented in an easy to digest form showing how many people had positive and negative experience with Fuse Workforce Payroll. With that information at hand you should be equipped to make an informed buying decision that you won’t regret. What are Fuse Workforce Payroll pricing details? What integrations are available for Fuse Workforce Payroll?